Turn stained grout new again. Renews up to 75 sq. ft. of grouted tile area with easy to use applicator. White. Concentrated crystals that mix with water to make a mild, safe to use, acid cleaner. Removes dried Portland cement, grout haze and mortar residue from tile, concrete and masonry. Safe for use on all colors of grout, tile, day pavers, concrete and masonry. Removes hard water deposits, efflorescence and also etches concrete. Covers 300 sq ft per gallon. Industrial strength acidic cleaner for grout. Detergent and acid based blend, easily cleans and whitens floor grout. Cuts through soil and hard water build-up. Non-abrasive, Non-acidic formula breaks down soap scum and greasy build-up on tile and grout. Cleans all non-porous surfaces. Water-resistant compound grouts all ceramic and mosaic tile. Formulated with premium acrylic latex for fast, easy-to-use application. Seals and protects grout lines. Resists mildew, dirt penetration and discoloration. Can be used with colored grout. Penetrating formula for interior or exterior grout. Economical blend. Recommended for floor installations. Good for setting Saltillo and other similar clay pavers. Mix with custom additives, for increased performance. Meets ANSI A118.1 without additives. Meets ANSI A118.4 and ANSI A118.11 when mixed with Acrylic Mortar Admix. High performance unmodified mortar for most basic tile jobs. Premium quality and economy. Ultra smooth and creamy. Exceeds ANSI A118.1 without additives and Exceeds ANSI A118.4 and ANSI A118.11 when mixed with AMA or CustomFlex. 20 percent greater coverage. Use on vitreous, semi-vitreous or absorptive tile: ceramic, quarry, cement; brick and mini-brick, precast terrazzo; natural stone tile; and impervious porcelain tile, glass mosaics. Covers 85 - 95 sq. ft. (7.9 - 8.4 sq m) per 50 lbs (22.68 kg). applied with a 1/4" x 1/4" x 1/4" square-notch trowel. A smooth acrylic latex formula, ready to use from the can. For grouting new tile or tile repair. Use in mosaic work, to reset ceramic pieces or around shower, tubs, sinks and marble sills. Can be applied with moistened finger, cloth or spatula. Sets quickly, may be tinted with any latex or universal colorant. Acrylic latex formula stay bright white. Not a tub caulk. Formulated for the installation of quarry, ceramic and mastic tile on walls. Can be used to install or repair tile in showers, in bathrooms, and on backsplashes. Ready-to-use. Ready-to-use liquid removes grout haze or residue and efflorescence with a safe-to-use acidic treatment. Glazed and unglazed ceramic tile (may etch some glazed tile), NOT for marble or polished stone. Economical blend. Recommended for floor installations. Good for setting Saltillo and other similar clay pavers. Mix with custom additives, for increased performance. Meets ANSI A118.1 without additives. Meets ANSI A118.4 and ANSI A118.11 when mixed with Acrylic Mortar Admix. High performance unmodified mortar for most basic tile jobs. Premium quality and economy. Ultra smooth and creamy. Exceeds ANSI A118.1 without additives and Exceeds ANSI A118.4 and ANSI A118.11 when mixed with AMA or CustomFlex. 20 percent greater coverage. Use on vitreous, semi-vitreous or absorptive tile: ceramic, quarry, cement; brick and mini-brick, precast terrazzo; natural stone tile; and impervious porcelain tile, glass mosaics. Covers 85 - 95 sq. ft. (7.9 - 8.4 sq m) per 50 lbs (22.68 kg). applied with a 1/4" x 1/4" x 1/4" square-notch trowel. Water-resistant compound grouts all ceramic and mosaic tile. Formulated with premium acrylic latex for fast, easy-to-use application. Polymer-modified for strength, just add water. Adheres to most surfaces and types of tile. Bonds well to vitreous, semi-vitreous or absorptive tile: ceramic quarry, cement; impervious porcelain tile, glass mosaics, brick and mini-brick, precast terrazzo, and natural stone tile. Fast setting even in cold weather. Exceeds ANSI: A118.4 and A118.11. Covers 80 - 90 sq. ft. per 50 lbs. when applied with a 1/4" x 1/4" x 1/4" square-notch trowel. For installations. For grouting vitreous, semi-vitreous or absorptive tile including ceramic, mosaic, quarry, pavers, cement, porcelain, brick, mini-brick, precast terrazzo and natural stone, for grout joints from 1/8" to 1/2" wide. Use on floors, countertops, walls, ceilings, showers. Smooth texture for easy spreading and cleanup. Rock-hard curing properties, dense joints that are highly resistant to shrinking, cracking, powdering and wear. Polymer-modified, mix with water for any tile or stone installation. Meets ANSI A118.6 specifications. Coverage will vary depending on tile size and joint width. Formulated to clean and maintain the natural beauty of stone. Contains an Aqua Mix sealer in its formulation to reseal as it cleans. Non-acidic formula. Penetrating sealer that resists most common oil and water based stains as well as dirt and grease. Protects grout, Satillo, porcelain and quarry tile, terra-cotta, masonry, brick, concrete, and natural stone. Will not leave a difficult, hard to remove residue. Low odor, water-based, neutral pH formula. On polished or dense surfaces. 1 quart covers 200-300 sq. feet while 1 gallon covers 800 to 1200 sq. ft. On porous surfaces 1 quart covers 50-100 sq. ft. while 1 gallon covers 200-400 sq. ft. 2-3 hour drying time. Can be recoated in 24 hours. Formulated to clean and maintain the natural beauty of your stone. Use on marble, travertine, limestone and slate. Contains Aqua Mix sealer in its formula to reseal as it cleans. Non-acidic. For installations. For grouting vitreous, semi-vitreous or absorptive tile including ceramic, mosaic, quarry, pavers, cement, porcelain, brick, mini-brick, precast terrazzo and natural stone, for grout joints from 1/8" to 1/2" wide. Use on floors, countertops, walls, ceilings, showers. Smooth texture for easy spreading and cleanup. Rock-hard curing properties, dense joints that are highly resistant to shrinking, cracking, powdering and wear. Polymer-modified, mix with water for any tile or stone installation. Meets ANSI A118.6 specifications. Coverage will vary depending on tile size and joint width. For installations. For grouting vitreous, semi-vitreous or absorptive tile including ceramic, mosaic, quarry, pavers, cement, porcelain, brick, mini-brick, precast terrazzo and natural stone, for grout joints from 1/8" to 1/2" wide. Use on floors, countertops, walls, ceilings, showers. Smooth texture for easy spreading and cleanup. Rock-hard curing properties, dense joints that are highly resistant to shrinking, cracking, powdering and wear. Polymer-modified, mix with water for any tile or stone installation. Meets ANSI A118.6 specifications. Coverage will vary depending on tile size and joint width. For the protection of granite, marble, travertine, slate and grout. Penetrates into the surface and forms an invisible barrier that is resistant to moisture and stains, while allowing vapor to escape. Resists water and stains. USDA approved. UV transparent. Covers up to 250 linear feet per can. For installations. For grouting vitreous, semi-vitreous or absorptive tile including ceramic, mosaic, quarry, pavers, cement, porcelain, brick, mini-brick, precast terrazzo and natural stone, for grout joints from 1/8" to 1/2" wide. Use on floors, countertops, walls, ceilings, showers. Smooth texture for easy spreading and cleanup. Rock-hard curing properties, dense joints that are highly resistant to shrinking, cracking, powdering and wear. Polymer-modified, mix with water for any tile or stone installation. Meets ANSI A118.6 specifications. Coverage will vary depending on tile size and joint width. For grouting porous floor and wall tiles with joints up to 1/8" wide. Use with glazed tile and polished marble that can be scratched by sanded grout. Use on floors, countertops, walls, ceilings, showers, fountains and pools. Cures hard, is non-shrinking and durable. Meets ANSI A118.6 specifications. Coverage will vary depending on tile size and joint width. Shrink and crack-resistant formula is also resistant to common household stains. Easy to use and ideal for grout restoration. For joints 1/16? to 1/2?. Grouts ceramic, mosaic, quarry, porcelain, stone tile, marble and granite. Suitable for wet areas such as tub surrounds, shower floors and shower walls. Shrink and crack-resistant formula is also resistant to common household stains. Easy to use and ideal for grout restoration. For joints 1/16? to 1/2?. Grouts ceramic, mosaic, quarry, porcelain, stone tile, marble and granite. Suitable for wet areas such as tub surrounds, shower floors and shower walls. Shrink and crack-resistant formula is also resistant to common household stains. Easy to use and ideal for grout restoration. For joints 1/16? to 1/2?. Grouts ceramic, mosaic, quarry, porcelain, stone tile, marble and granite. Suitable for wet areas such as tub surrounds, shower floors and shower walls. For installations. For grouting vitreous, semi-vitreous or absorptive tile including ceramic, mosaic, quarry, pavers, cement, porcelain, brick, mini-brick, precast terrazzo and natural stone, for grout joints from 1/8" to 1/2" wide. Use on floors, countertops, walls, ceilings, showers. Smooth texture for easy spreading and cleanup. Rock-hard curing properties, dense joints that are highly resistant to shrinking, cracking, powdering and wear. Polymer-modified, mix with water for any tile or stone installation. Meets ANSI A118.6 specifications. Coverage will vary depending on tile size and joint width. For installations. For grouting vitreous, semi-vitreous or absorptive tile including ceramic, mosaic, quarry, pavers, cement, porcelain, brick, mini-brick, precast terrazzo and natural stone, for grout joints from 1/8" to 1/2" wide. Use on floors, countertops, walls, ceilings, showers. Smooth texture for easy spreading and cleanup. Rock-hard curing properties, dense joints that are highly resistant to shrinking, cracking, powdering and wear. Polymer-modified, mix with water for any tile or stone installation. Meets ANSI A118.6 specifications. Coverage will vary depending on tile size and joint width. Penetrating sealer that resists most common oil and water-based stains. Can be used to apply sealer to sanded or non-sanded grout while in a standing position with 360 nozzle. Protects sanded and non-sanded grout joints from grease, coffee, wine, cooking oil, bath oils, colored juices, ketchup, mustard and every-day dust and dirt to keep grout bright and new. Covers 525 linear feet per 15 oz can. A smooth acrylic latex formula, ready to use from the can. For grouting new tile or tile repair. Use in mosaic work, to reset ceramic pieces or around shower, tubs, sinks and marble sills. Can be applied with moistened finger, cloth or spatula. Sets quickly, may be tinted with any latex or universal colorant. Acrylic latex formula stay bright white. Not a tub caulk. For installations. For grouting vitreous, semi-vitreous or absorptive tile including ceramic, mosaic, quarry, pavers, cement, porcelain, brick, mini-brick, precast terrazzo and natural stone, for grout joints from 1/8" to 1/2" wide. Use on floors, countertops, walls, ceilings, showers. Smooth texture for easy spreading and cleanup. Rock-hard curing properties, dense joints that are highly resistant to shrinking, cracking, powdering and wear. Polymer-modified, mix with water for any tile or stone installation. Meets ANSI A118.6 specifications. Coverage will vary depending on tile size and joint width. For installations. For grouting vitreous, semi-vitreous or absorptive tile including ceramic, mosaic, quarry, pavers, cement, porcelain, brick, mini-brick, precast terrazzo and natural stone, for grout joints from 1/8" to 1/2" wide. Use on floors, countertops, walls, ceilings, showers. Smooth texture for easy spreading and cleanup. Rock-hard curing properties, dense joints that are highly resistant to shrinking, cracking, powdering and wear. Polymer-modified, mix with water for any tile or stone installation. Meets ANSI A118.6 specifications. Coverage will vary depending on tile size and joint width. For installations. For grouting vitreous, semi-vitreous or absorptive tile including ceramic, mosaic, quarry, pavers, cement, porcelain, brick, mini-brick, precast terrazzo and natural stone, for grout joints from 1/8" to 1/2" wide. Use on floors, countertops, walls, ceilings, showers. Smooth texture for easy spreading and cleanup. Rock-hard curing properties, dense joints that are highly resistant to shrinking, cracking, powdering and wear. Polymer-modified, mix with water for any tile or stone installation. Meets ANSI A118.6 specifications. Coverage will vary depending on tile size and joint width. Polymer-modified for strength, just add water. Adheres to most surfaces and types of tile. Bonds well to vitreous, semi-vitreous or absorptive tile: ceramic quarry, cement; impervious porcelain tile, glass mosaics, brick and mini-brick, precast terrazzo, and natural stone tile. Fast setting even in cold weather. Exceeds ANSI: A118.4 and A118.11. Covers 80 - 90 sq. ft. per 50 lbs. when applied with a 1/4" x 1/4" x 1/4" square-notch trowel. Designed for ceramic & porcelain tile, natural stone & grout. Removes dirt and stains. Nontoxic cleaner that can handle the most difficult stains, yet is gentle enough for everyday use. Covers up to 1,000-10,000 sq ft per gallon. Portland cement-based polymer modified. For the installation of quarry, stone, ceramic and mosaic tile over most interior and exterior surfaces. Can also be used to install porcelain tile over interior absorbent concrete surfaces. Covers 70 to 80 sq. ft. per 40 lbs. bag with 1/4" x 1/4" x 1/4" square notched trowel. Abrasive cleaner that utilizes nano-sized particles to penetrate into small surface pores where it can work to remove surface stains and residues. Removes factory applied waxes and floor finishes, coating sealers, light grout residue (including epoxy), rubber and pencil marks, light mineral deposits, ground-in dirt and most sealer residues. Non-toxic, non-flammable and non-acidic. Cream consistency. Covers 200-2,000 sq ft per gallon. Portland cement dry grout used for joints up to 1/8" wide. For highly glazed ceramic tile or highly polished marble or natural stone that can be scratched by sanded grouts. Use on floors, countertops, walls, ceilings, showers, fountains and pools. Non-shrinking and durable. Meets ANSI A118.6 specifications. Rated (ASTM C67) for residential to extra heavy commercial use. Portland cement dry grout used for joints up to 1/8" wide. For highly glazed ceramic tile or highly polished marble or natural stone that can be scratched by sanded grouts. Use on floors, countertops, walls, ceilings, showers, fountains and pools. Non-shrinking and durable. Meets ANSI A118.6 specifications. Rated (ASTM C67) for residential to extra heavy commercial use. For installations. For grouting vitreous, semi-vitreous or absorptive tile including ceramic, mosaic, quarry, pavers, cement, porcelain, brick, mini-brick, precast terrazzo and natural stone, for grout joints from 1/8" to 1/2" wide. Use on floors, countertops, walls, ceilings, showers. Smooth texture for easy spreading and cleanup. Rock-hard curing properties, dense joints that are highly resistant to shrinking, cracking, powdering and wear. Polymer-modified, mix with water for any tile or stone installation. Meets ANSI A118.6 specifications. Coverage will vary depending on tile size and joint width. Portland cement dry grout used for joints up to 1/8" wide. For highly glazed ceramic tile or highly polished marble or natural stone that can be scratched by sanded grouts. Use on floors, countertops, walls, ceilings, showers, fountains and pools. Non-shrinking and durable. Meets ANSI A118.6 specifications. Rated (ASTM C67) for residential to extra heavy commercial use. Portland cement dry grout used for joints up to 1/8" wide. For highly glazed ceramic tile or highly polished marble or natural stone that can be scratched by sanded grouts. Use on floors, countertops, walls, ceilings, showers, fountains and pools. Non-shrinking and durable. Meets ANSI A118.6 specifications. Rated (ASTM C67) for residential to extra heavy commercial use. Portland cement dry grout used for joints up to 1/8" wide. For highly glazed ceramic tile or highly polished marble or natural stone that can be scratched by sanded grouts. Use on floors, countertops, walls, ceilings, showers, fountains and pools. Non-shrinking and durable. Meets ANSI A118.6 specifications. Rated (ASTM C67) for residential to extra heavy commercial use. Designed to remove dirt and soil from granite, marble, natural stone, ceramic & porcelain tile & grout. Cuts through dirt and soil with no rinsing, no streaking and no soapy residue left behind. Cover up to 1,000 sq ft per 32 Oz. Coverage varies depending on surface. Portland cement-based polymer modified. For the installation of porcelain, quarry, stone, ceramic and mosaic tile over most interior and exterior surfaces. Can also be used to install porcelain tile over interior plywood floors. Spread ratio with the 1/4" x 1/4" x 1/4" is 80 square feet per 40 lbs. Portland cement-based polymer modified. For the installation of porcelain, quarry, stone, ceramic and mosaic tile over most interior and exterior surfaces. Can also be used to install porcelain tile over interior plywood floors. Spread ratio with the 1/4" x 1/4" x 1/4" is 80 square feet per 40 lbs. Polymer-modified mortar for time-critical installations such as restaurants, malls and hotel lobbies. Excellent for cold temperature installations. Grout in 2 hours, traffic in 6. Protected by MoldGard Technology to resist mold and mildew growth. Tile Types: Vitreous, semi-vitreous or absorptive tile: ceramic, mosaic, quarry, cement. Impervious porcelain and glass tile, brick and mini-brick, precast terrazzo, natural stone tile. Substrates: Concrete, mortar beds, masonry, Portland cement plaster, gypsum wallboard, cement backerboards, exterior grade plywood, existing ceramic tile, sheet vinyl flooring, VCT, plastic laminates, cutback adhesive. Polymer-modified for strength, just add water. Adheres to most surfaces and types of tile. Bonds well to vitreous, semi-vitreous or absorptive tile: ceramic quarry, cement; impervious porcelain tile, glass mosaics, brick and mini-brick, precast terrazzo, and natural stone tile. Fast setting even in cold weather. Exceeds ANSI: A118.4 and A118.11. Covers 80 - 90 sq. ft. per 50 lbs. when applied with a 1/4" x 1/4" x 1/4" square-notch trowel. Designed for the protection of natural stone, tile, grout and masonry surfaces. Forms an invisible barrier that is resistant to moisture and stains while allowing vapor to escape. Not a surface coating and will not alter the natural look. Treated surfaces are harder and less slippery. Ok for food areas. UV transparent. Covers approximately 1,000-4,000 sq ft per gallon. Portland cement-based polymer modified. For the installation of porcelain, quarry, stone, ceramic and mosaic tile over most interior and exterior surfaces. Can also be used to install porcelain tile over interior plywood floors. Spread ratio with the 1/4" x 1/4" x 1/4" is 80 square feet per 40 lbs. Portland cement-based polymer modified. For the installation of quarry, stone, ceramic and mosaic tile over most interior and exterior surfaces. Can also be used to install porcelain tile over interior absorbent concrete surfaces. Covers 70 to 80 sq. ft. per 40 lbs. bag with 1/4" x 1/4" x 1/4" square notched trowel. Spray on and wash off to keep your dirty tile and grout looking like new. Polymer-modified for strength, just add water. Adheres to most surfaces and types of tile. Bonds well to vitreous, semi-vitreous or absorptive tile: ceramic quarry, cement; impervious porcelain tile, glass mosaics, brick and mini-brick, precast terrazzo, and natural stone tile. Fast setting even in cold weather. Exceeds ANSI: A118.4 and A118.11. Covers 80 - 90 sq. ft. per 50 lbs. when applied with a 1/4" x 1/4" x 1/4" square-notch trowel. Use for setting all types of tile. Use over any surface such as floors, walls and countertops. Dries fast. Strength of a thin set mortar, ease of use of a mastic. Water resistant. Yields over one gallon of adhesive. Covers 60 sq. ft. per 7.5 lb. box when applied with a 5/32"D x 3/16"W V-notched trowel for setting floor and wall tile up to 8" x 8". Over 8" x 8" with a 1/4" x 1/4" x 1/4" square notched trowel covers 25 sq. ft. per 7.5 lb. box. For saltillo, terra-cotta, quarry tile, slate and flagstone. Seals the surface to resists stains, dirt and grease. Beautifies and enhances color while providing scuff, mar and scratch resistance. Low odor. Will not yellow with age. Covers 75-125 sq ft.
For saltillo, terra-cotta, quarry tile, slate and flagstone. Seals the surface to resist stain, dirt and grease. Beautifies and enhances color. Provides scuff, mar and scratch resistance. Low odor. Will not yellow with age. Use in dry areas only. Covers 75-125 sq. ft. Portland cement-based polymer modified. For the installation of porcelain, quarry, stone, ceramic and mosaic tile over most interior and exterior surfaces. Can also be used to install porcelain tile over interior plywood floors. Spread ratio with the 1/4" x 1/4" x 1/4" is 80 square feet per 40 lbs. Premium polymer modified, portland cement-based grout for grouting porcelain, glass, quarry, stone, ceramic and mosaic tile for interior and exterior floors, walls, and countertops. Stain resistant, highly flexible, and water resistant. Polymer-modified for strength, just add water. Adheres to most surfaces and types of tile. Bonds well to vitreous, semi-vitreous or absorptive tile: ceramic quarry, cement; impervious porcelain tile, glass mosaics, brick and mini-brick, precast terrazzo, and natural stone tile. Fast setting even in cold weather. Exceeds ANSI: A118.4 and A118.11. Covers 80 - 90 sq. ft. per 50 lbs. when applied with a 1/4" x 1/4" x 1/4" square-notch trowel. For small to large format natural stone, ceramic or porcelain tile 15" x 15" or larger, clay pavers or other thin or medium bed applications. Non-slumping formula that eliminates lippage and minimizes leveling requirements. Can be applied for horizontal applications as thick as 3/4" or for thin bed applications to 1/4". Covers 35-100 sq ft. per 50 lb bag. Coverage depends upon trowel size. Exceeds ANSI A118.1, A118.4, and A118.11. Use as a sealer or grout release. Provides protection for marble, stone, porcelain, quarry and saltillo tile, grout, concrete and masonry. Repels dirt, oil and stains allowing easy clean up. Resists mold and mildew growth. Use when maximum protection is required such as in food preparation areas, floors and other high traffic areas. Allows moisture vapor transmission. Coverage on polished or dense surfaces 100-150 sq. ft. per pint, 200-300 sq. ft. per quart, 800-1200 sq. ft. per gallon. Coverage on porous surfaces 25-50 sq. ft. per pint, 50-100 sq. ft. per quart, 200-400 sq. ft. per gallon. Designed for the protection of natural stone, tile, grout and masonry surfaces. Forms an invisible barrier that is resistant to moisture and stains while allowing vapor to escape. Not a surface coating and will not alter the natural look. Treated surfaces are harder and less slippery. Ok for food areas. UV transparent. Covers approximately 1,000-4,000 sq ft per gallon. Color enhancer and penetrating sealer for all types of porous natural stone and grout. Rejuvenates the color and appearance of worn, faded stone, tumbled-marble and other rustic-look stones. Can also be used to darken the color of grout. Provides long-lasting protection against oil, grease and stains. Low odor. Complies with all federal and SCAQMD standards for VOCs. Covers 30-190 sq ft per 24 oz. Coverage depends on surface type. Premium quality, polymer-modified mortar with outstanding flexibility and bond strength. FlexBond is exceptional for tiling over difficult-to-bond surfaces and for setting impervious porcelain or glass tile. Isolates cracks up to 1/16? and withstands minor substrate deflection. Protected by MoldGard Technology to resist mold and mildew growth. Tile Types: Vitreous, semi-vitreous or absorptive tile: ceramic, quarry, cement. Impervious porcelain and glass tile, brick and mini-brick, precast terrazzo, natural stone tile. Substrates: Concrete, mortar beds, masonry, Portland cement plaster, gypsum wallboard, cement backerboards, exterior grade plywood, existing ceramic tile, sheet vinyl flooring, VCT, plastic laminates, cutback adhesive. Use on all cement, latex and sanded grout, unglazed quarry tile, brick and masonry. Achieve an invisible water-repellent seal and minimize the effects of soap, dirt, grease, grime, alcohol, mildew and food stains. Bonds ceramic tile up to 18" x 18". For interior wall and floor installations. Exceeds ANSI A136 Type I. Covers 20 to 50 sq. ft. depending upon the size of trowel and tile. Bonds porcelain, stone, marble, granite and ceramic tile up to 18" x 18". For interior wall and floor installations. Exceeds ANSI A136.1 Type I. Covers 20 to 50 sq. ft. depending upon the size of trowel and tile. Rejuvenates the color and improves the appearance of worn and weathered stone. May be used as a pre-grouting sealer. Allows moisture-vapor transmission. Seals and darkens the color of grout joints. Use on unsealed natural stone. Complies with all Federal EPA and SCAQMD standards for VOC. Covers 500-1,500 sq ft per gallon. Coverage depends on type of stone or tile, porosity and texture of surface, temperature, humidity and method of application. Mix with custom standard thin-set mortars. Increases bond strength and performance. Improves water resistance. Designed to be used in place of water to increase performance and bond strength of PremiumPlus, CustomBlend and Wall Tile Thin-set Mortars, non-polymer modified grouts or Portland cement mortar mixes. Adds water resistance and improves shock absorption. Meets ANSI A118.4 and A118.11 installation requirements. Use on interior and exterior floors, walls, countertops. For coverage refer to individual Custom Thin-Set Mortars. Bonds ceramic tile up to 18" x 18". For interior wall and floor installations. Exceeds ANSI A136 Type I. Covers 20 to 50 sq. ft. depending upon the size of trowel and tile. Shrink and crack-resistant formula is also resistant to common household stains. Easy to use and ideal for grout restoration. For joints 1/16? to 1/2?. Grouts ceramic, mosaic, quarry, porcelain, stone tile, marble and granite. Suitable for wet areas such as tub surrounds, shower floors and shower walls. Shrink and crack-resistant formula is also resistant to common household stains. Easy to use and ideal for grout restoration. For joints 1/16? to 1/2?. Grouts ceramic, mosaic, quarry, porcelain, stone tile, marble and granite. Suitable for wet areas such as tub surrounds, shower floors and shower walls. Shrink and crack-resistant formula is also resistant to common household stains. Easy to use and ideal for grout restoration. For joints 1/16? to 1/2?. Grouts ceramic, mosaic, quarry, porcelain, stone tile, marble and granite. Suitable for wet areas such as tub surrounds, shower floors and shower walls. Bonds porcelain, stone, marble, granite and ceramic tile up to 18" x 18". For interior wall and floor installations. Exceeds ANSI A136.1 Type I. Covers 20 to 50 sq. ft. depending upon the size of trowel and tile. Premium polymer modified, portland cement-based grout for grouting porcelain, glass, quarry, stone, ceramic and mosaic tile for interior and exterior floors, walls, and countertops. Stain resistant, highly flexible, and water resistant. Premium polymer modified, portland cement-based grout for grouting porcelain, glass, quarry, stone, ceramic and mosaic tile for interior and exterior floors, walls, and countertops. Stain resistant, highly flexible, and water resistant. Premium polymer modified, portland cement-based grout for grouting porcelain, glass, quarry, stone, ceramic and mosaic tile for interior and exterior floors, walls, and countertops. Stain resistant, highly flexible, and water resistant. Portland cement-based patch that can be installed over almost any surface to provide a smooth permanent finish prior to the installation of floor coverings. Dries in 15 minutes, allowing for fast repairs and installations. Covers 198 sq. ft. at a skimcoat. Penetrating sealer that resists most common oil and water based stains as well as dirt and grease. Protects grout, Satillo, porcelain and quarry tile, terra-cotta, masonry, brick, concrete, and natural stone. Will not leave a difficult, hard to remove residue. Low odor, water-based, neutral pH formula. On polished or dense surfaces. 1 quart covers 200-300 sq. feet while 1 gallon covers 800 to 1200 sq. ft. On porous surfaces 1 quart covers 50-100 sq. ft. while 1 gallon covers 200-400 sq. ft. 2-3 hour drying time. Can be recoated in 24 hours. Formulated for the installation of quarry, ceramic and mastic tile on walls. Can be used to install or repair tile in showers, in bathrooms, and on backsplashes. Ready-to-use. For commercial and residential tile and stone installations. Reduces crack transmission in ceramic tile or stone floors. Bonds directly to metal drains, PVC, stainless steel and ABS drain assemblies. Can also be used as a slab-on-grade moisture barrier under resilient flooring. Meets ANSI A118.10 for waterproofing membranes and ANSI A118.12 for crack isolation membranes. Meets Uniform Plumbing Code specifications for use as a shower pan liner. As a crack prevention covers about 110 sq. ft. at 30 mil thickness when wet per gallon. As a waterproof membrane, covers about 35 to 40 sq. ft. at 93 mil thickness when wet, 47 mils. dry. Use as a sealer or grout release. Provides protection for marble, stone, porcelain, quarry and saltillo tile, grout, concrete and masonry. Repels dirt, oil and stains allowing easy clean up. Resists mold and mildew growth. Use when maximum protection is required such as in food preparation areas, floors and other high traffic areas. Allows moisture vapor transmission. Coverage on polished or dense surfaces 100-150 sq. ft. per pint, 200-300 sq. ft. per quart, 800-1200 sq. ft. per gallon. Coverage on porous surfaces 25-50 sq. ft. per pint, 50-100 sq. ft. per quart, 200-400 sq. ft. per gallon. 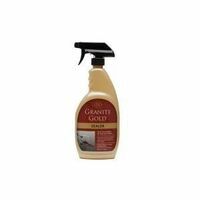 Granite Gold Penetrating Sealer, 24 oz Capacity, 6.4 % VOC, 7 - 8 pH, Liquid, Clear, 4 hr Drying Time, Slight Alcohol Odor/Scent, >250 deg F Flash Point, Media: Carbon Dioxide, Dry Chemical, Foam and Halon, Composition: Water, Flammability Rating: 1, Number of Mixing Steps, Temperature Range, Pressure Range, Resists, Includes For commercial and residential tile and stone installations. Reduces crack transmission in ceramic tile or stone floors. Bonds directly to metal drains, PVC, stainless steel and ABS drain assemblies. Can also be used as a slab-on-grade moisture barrier under resilient flooring. Meets ANSI A118.10 for waterproofing membranes and ANSI A118.12 for crack isolation membranes. Meets Uniform Plumbing Code specifications for use as a shower pan liner. As a crack prevention covers about 110 sq. ft. at 30 mil thickness when wet per gallon. As a waterproof membrane, covers about 35 to 40 sq. ft. at 93 mil thickness when wet, 47 mils. dry. A rigid substrate made of Portland cement, aggregate and glass mesh. It provides a hard, durable surface that is able to withstand prolonged exposure to moisture. An ideal underlayment for interior applications such as shower and tub enclosures, countertops and floors as well as exterior applications such as stone and/or thin brick.